Little Farm in the Foothills: Holiday Magic: Yule Lads, St. Lucia, and 2 Goodreads Giveaways! Holiday Magic: Yule Lads, St. Lucia, and 2 Goodreads Giveaways! Ah, the December holidays…Catalogs jamming your mailbox…overpriced gift suggestions filling your favorite magazines…your Visa card screaming for mercy… Where is the magic, I ask you? If you need a break from Christmas commercialism, go no further than checking out the holiday rituals of other countries—most of which involve lots of yummy food and no trips to the mall. In Sweden, the Christmas season begins today, December 13, when Swedes celebrate the feast day of Saint Lucia. Traditionally, young girls wear an evergreen wreath with seven lighted candles upon their heads, and serve their families coffee and buns. The magic seems to be that not many girls’ hair has caught on fire or else someone would have come up with a new way to celebrate! You might also like the Christmas rituals of Switzerland--lots of bell ringing and huge homemade doughnuts called ringli. The Danish seem to embody the holiday spirit—giving each other baskets made from paper hearts filled with candy. And the French custom of le réveillon, a big family meal that takes place after midnight Mass on Christmas Eve, must be really splendid (or magical), since everyone seems to have the energy to stay awake for the big celebration. When it comes to holiday magic and whimsy, however, the traditions of Iceland rule! Instead of Santa, Icelandic people celebrate with the legend of the "Yule Lads." The Lads are the 13 sons of mountain trolls who visit the towns and villages across Iceland to make mischief, beginning on the 13 days before Christmas. Each of the 13 trolls has a name that relates to his own brand of prank—think “Bowl Licker” or “Sausage Swiper,” and he gets his own night to made trouble. If you’ve been good, the Yule Lad will leave a sweet or gift in your shoe. If you haven’t, you don’t get a lump of coal…you get a rotten potato. Now there’s an incentive to behave yourself! To celebrate the season closer to home, I'm currently running Goodreads Giveaways of my 2 holiday books! The Hopeful Romantic, Book 3 of my Irish Village of Ballydara series, will be a Goodreads Giveaway until just after Christmas. 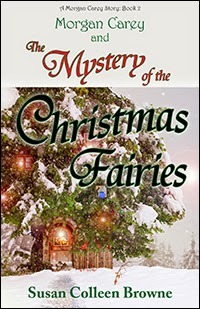 You can also enter to win a signed copy of Morgan Carey and The Mystery of the Christmas Fairies, the 2nd book of my Morgan Carey fantasy-adventure series for tweens, until December 29... You'll find more about my books at www.susancolleenbrowne.com! And may your holidays be filled with wonder and magic! PS--Thank you to Believe: Christmas Treasury, by Mary Engelbreit, and "Not Home for the Holidays" by Brian J. Cantwell (Seattle Times, December 11, 2016) for inspiring this post!